Exalted is the tale of a forgotten mythic age, a time when spirits walked openly among men, the world was flat and floated atop a sea of chaos, and the restless dead roamed on moonless nights. Heroes granted power by the mightiest gods war and intrigue against one another for the fate of the Realm. These are the Exalted, and their one-time rulers, the mighty Solar Exalted, have recently returned to reclaim the world from those that betrayed them. The Solars can slay gods with immortal blades, balance on a drifting feather, master all-powerful sorcery, walk unburnt across endless deserts, and outwit the demon princes of Hell. First released in 2001, Exalted took fantasy gaming by storm and launched a renaissance of pulp-inspired, high-octane, swords and sorcery roleplaying which continues to this day. Its first edition was one of the most popular roleplaying games of the 2000s, and its second edition led the charge into digital publishing, establishing a record number of best-selling digital products. 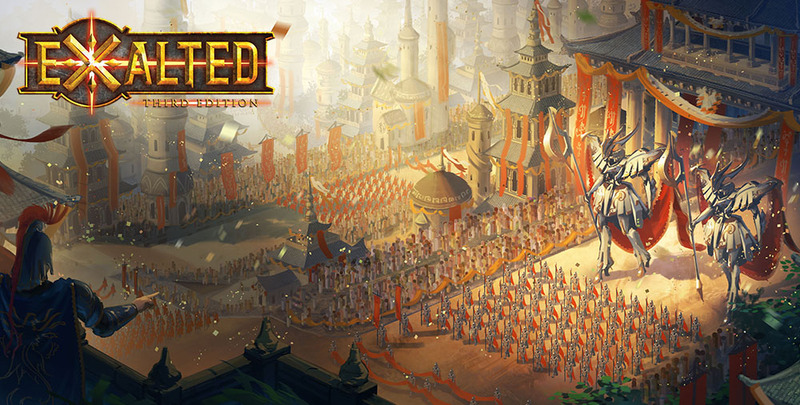 After breaking all records with the highest-funded tabletop RPG Kickstarter at the time, Exalted is currently in its third edition. Onyx Path Publishing offers a number of role-playing game fiction, comics, and clothing products for Exalted, and its entire publishing library is available in PDF and print-on-demand formats. If this sounds interesting to you, head over to our DriveThruRPG storefront to get Exalted 3rd Edition. Exalted merchandise is available via our RedBubble store.